Just imagine – March 1917, the city of Pskov… Tsar Nicholas II of Russia signs a forced abdication and hands over the signed document. But instead of lighting up a cigarette, the first thing he reaches for is… his iPhone. 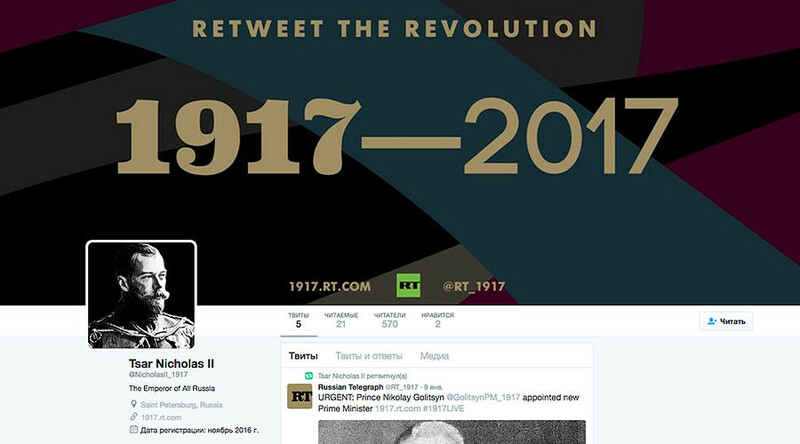 RT's large-scale #1917LIVE project, which was soft-launched on New Year’s Eve, aims to tell the story of the Russian Revolution through real-time tweeting. #1917LIVE runs dozens of Twitter accounts in the names of all the key historical figures of that time, like Lenin, Stalin, Kerensky, Tsar Nicholas and his family, Imperial generals, military, police, transitional government officials, MPs, foreign embassies, and of course, ordinary people who went through the turbulent events of 1917. The project aims to give people the feeling that the events are unfolding right now, right next door, with thousands of real-time tweets coming up in 2017. “Our task is not only to recount historic events in Twitter’s dynamic and intense style, but to spark global interest in one of the biggest geo-political events of the 20th century, which may not be widely understood in the West,” RT’s head of online projects and digital media director, Kirill Karnovich-Valua, said. And there is much more than that: live streams, videos, polls, and even live Q&As will be part of the project. “We’re proud of how the project is getting attention from influencers, but also crucially, our core audience, despite having just soft-launched. For us, the project is about engaging with our audience, and giving something back to them for the fantastic support they show us day-in, day-out. They are the key participants in #1917LIVE. We want the project to educate and inspire our audience to learn, while setting new best-in-class Twitter standards,” Ivor Crotty, head of RT social media team, says. With a number of accounts already LIVE (fictional media outlet The Russian Telegraph gained hundreds of retweets in a matter of days after the launch), the project will fully expand and intensify this February. But you can follow it now: relive the revolution, retweet the revolution!